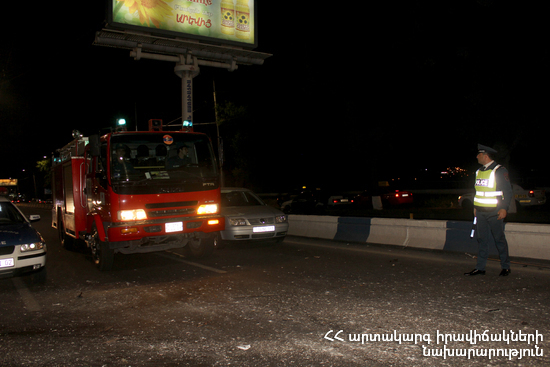 On February 11, at 01:02 information was received to “911” service that a car accident had occurred near “Neptun” complex in Malatia-Sebastia administrative district, Yerevan: there was a gas leak from a car. The rescuers' help was needed. It turned out that “Lada 21099” car had run off the roadway, crashed into a curb and turned over near 42/9 Isakov Avenue. Before the rescuers arrived at the scene the driver had been hospitalized to “Astghik” medical center. According to doctors the casualty was in satisfactory condition. The rescuers put the car back onto its wheels, disconnected the automotive battery and closed the gas valve of the car.